Larry G. Herr is Prof. of Archaeology, Canadian University College, Alberta, Canada and together with Douglas R. Clark, Exec. Director, American Schools of Oriental Research, Boston, directs the Madaba Plains Project. This project, together with the Jordan Department of Antiquities, headed by Director-General, Fawwaz al-Khraysheh, has found a temple at Tall Al-Umayri which contains a shrine of megaliths built into an ancient wall. The temple consists of four rooms, with the megaliths being found in the largest room. The megaliths (obviously to symbolize the heavens) tower 3 meters above the heads of the temple excavators. The archaeologists have dated the temple to 1500 BC. I do not know what their basis for this dating is - but my decipherment of the megaliths indicates that these stones as cupmarked may date to ca. 3117 BC. If the walls are indeed more recent, then the original - older - megaliths were integrated into the walls of the temple many years later than their original creation. The megaliths are carved and also have cupmarks, especially the middle large round megalithic stone, which appears to have the stars of Andromeda cupmarked on it. To the left we find what I identify provisionally as the stars of Perseus, the Pleiades and Aries, with Taurus carved on the adjacent wall. To the right we find possibly Lacerta, Pegasus, and Aquarius. Above, the wall marks the Milky Way, Cassiopeia, and Cepheus. Below we find the clear shapes of fish for Pisces and a large whale for Cetus including an apparent marking of the South Galactic Pole near Phoenix. 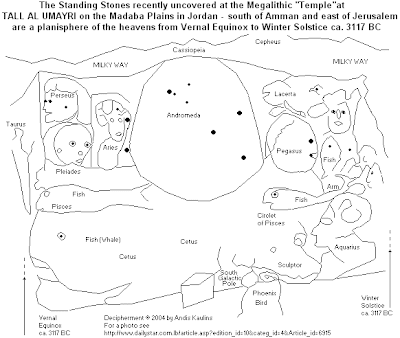 In the astronomical survey of the fertile crescent, we thus find - provisionally - that Jordan apparently marked Andromeda, as evidenced by the large prominent stone in the temple - the one with the stars of Andromeda cupmarked on it. JORDAn is a name said to derive from Hebrew YARAD meaning "descend" or "flow down" and thus originally surely applied to the River Jordan. We find the ancient Arabic name al 'ARD for Andromeda to be possibly related to JORDan (see Richard Hinckley Allen, Star Names, p. 36). Perhaps this is origin of the astronomical line marked here at Andromeda as al RISHA, the band of the fish, which was called ARIT in Egypt, according to Renouf, an identification supported by the later Coptic ARTulosia, which referred to the moon station at Alpheratz in that same constellation Andromeda. All of those terms are similar matching the geography to astronomy in the hermetic system. It is thus perhaps no accident and rather the product of many thousands of years of tradition that the Madaba Mosaic Map from Madaba, Jordan (ca. 6th-7th cent. A.D.), though partially destroyed, is regarded to be one of the best ancient maps of Biblical lands. In researching the ancient border stones in the Holy Land, I came upon the following interesting information about Gad, Akkad, Jordan, Amman and a host of other topics, including an ancient border treaty that was celebrated by the building of a megalithic site, about which we have posted previously at LexiLine. See the end of this posting if you are curious. I suggest that in the ancient cuneiform texts the term uman x (UR5) is Amman, Jordan, which is Umman-manda in Akkadian, "an undetermined people" according to the Glossary of Proper Names in Mesopotamia in Douglas B. Miller and R. Mark Shipp, An Akkadian Handbook, 1996, p. 69, published by Eisenbrauns, POB 275, Winona Lake, IN, 46590, ISBN 0-931464-86-2. The x and the 5 are transcriptional subscripts, whereby the subscript 5 to UR means that this is a particular cuneiform sign so labelled as UR5, and which the scholars do not yet know how to differentiate from a simple UR sign. We have discovered that UR5 has a syllabic value which renders it Hebrew ARAWA, and it applied to everything EAST of the Jordan River - this was the land of GAD (i.e. AKKAD in the much more ancient period) and that is what in ancient Sumerian-Akkadian cuneiform script is written as wr.URI, UR5.RA which applied to Akkad at the time of Sargon ca. 2400 BC. "The ancient kingdom of Ammon was located in northwestern Arabia east of Gilead and the Dead Sea. The borders of the Ammonite territory are not uniformly defined in the Old Testament. In Judges 11:13, the claim of the king of Ammon, who demands of the Israelites the restoration of the land "from Arnon even unto Jabbok and unto Jordan" is mentioned only as an unjust claim, since the Israelite part of this tract had been conquered from the Amorite king Sihon, who had, in turn, displaced the Moabites; in Judges 11:22 it is stated that the Israelites had possession "from the wilderness even unto Jordan", and that they laid claim to territory beyond this, so as to leave no room for Ammon. The Book of Numbers 21:24 describes the Hebrew conquest as having reached "even unto the children of Ammon, for the border of the children of Ammon was Jazer." Joshua 13:25, defines the frontier of the tribe of Gad as being "Jazer ... and half the land of the children of Ammon." The latter statement can be reconciled with Num. 21:24 and Deuteronomy 2:19, 37 by assuming that the northern part of Sihon's Amorite kingdom had formerly been Ammonite. This explains, in part, the claim mentioned above (Judges, 11:13). According to Deuteronomy 2:37, the region along the river Jabbok and the cities of the hill country formed the border of Israel. On the authority of Deuteronomy 2:20, their territory had formerly been in the possession of a mysterious nation, the Zamzummim (also called Zuzim), and the war of Chedorlaomer (Gen. 14:5) with this nation may be connected with the history of Ammon. When the Israelites invaded Canaan, they passed by the frontier of the Ammonites. From their original territory, the Ammonites are supposed to have been expelled by Sihon, king of the Amorites. Sihon was said to have been found by the Israelites, after their deliverance from Egypt, in possession of Gilead, that is, the whole country on the left bank of the Jordan, to the north of the Arnon. By this invasion, the Ammonites were driven out of Gilead across the upper waters of the Jabbok, where it flows from south to north, which continued to be their western boundary. The other limits of the Ammonites, or country of the Ammonites were not exactly defined. On the south, it probably adjoined the land of Moab; on the north, it may have met that of the king of Geshur; and on the east it may have melted away into the desert peopled by Kedarites and other nomadic tribes." In the Bible, as can be read in Samuel, in the account of the battle involving King Saul [I claim this was Akhenaten] , Jonathon [I claim this was Tutankhamun] and the Philistines, some of the Hebrews had gone over the Jordan River "to the land of Gad and Gilead". SHIMAAAAL which in my opinion is equivalent to Sumer means "North" in ancient Arabic (comparable to Indo-European, e.g. Latvian ZIEMELI "North", rather than South, which is the Arabic term YMN, i.e. by extrapolation Yemen (Jemen). This naming of North and South pretty clearly puts the origin of the Arabs historically in the area of Saudi Arabia and that is in fact where they were located then, based on ancient maps. Saudi Arabia was called Arabia. At this time JORDAN-LAND or ARAWA was not ruled by the Arabs, but rather by Sargon, who according to the legend of Sargon, ruled "the black-headed" natives of this region: "The black-headed [people] I ruled, I gov[erned]...." Scholars have misinterpreted that text to mean that the ruling class of Sumer was also black-headed, but that is not what the text says. If Sargon's administration had also been black-headed, there would be no reason to specify the hair color of his subjects. We get a better idea to the solution of the riddle from the Jerusalem Illustrated Dictionary and Concordance of the Bible, where it states that Akkad was listed as a city under the dominion of the fabled king Nimrod (1st book of Moses, 10,10), located in Shinar (a term for all of Mesopotamia). This is in our opinion the same as Sihon viz. Sehon in Deuteronomy, where the Kingdom of Sehon has been equated/confused with the name of the King Sihon, headquartered at Heshbon, just south of Amman. These are also the Biblical Sinites (Hebrew Sıynıy) from regions to the east of the Holy Land. The term is sometimes written Thinai suggesting an original TSINAI which equates to Indo-European e.g. Latvian CINAJ- "moundy ground". In the Book of Genesis 10:10, the beginning of Nimrod's kingdom is said to have been "Babel, and Uruk, and Akkad, and Calneh, in the land of Shinar." The following chapter, 11:2, states that Shinar was a plain settled after the flood, where mankind, still speaking one language, built the Tower of Babel. In Genesis 14:1,9 Shinar is the land ruled by king Amraphel, who reigned in Babylon. "Shinar" is further mentioned in Joshua 7:21; Isaiah 11:11; Daniel 1:2; and Zechariah 5:11, as a general synonym for Babylonia. Some scholars have suggested that Shinar must have been confined to the northern part of Mesopotamia (plain of Sinjar, immediately south of Mount Judi and west of Mount Nisir), based on Jubilees 9:3 which allots "Shinar" (or in the Ethiopic text, "Sadna Sena`or") to Asshur. However, 10:20 states that the Tower was built with bitumen from the sea of Shinar. Other scholars such as David Rohl, however, have proposed that the Tower was actually located in Eridu, once located on the Persian Gulf, where there are ruins of a massive, ancient ziggurat worked from bitumen. This is where the sons of Shem, Ham and Japheth went after they tarried in the highlands of Armenia, after the flood (Vuibert, Ancient History)." That latter sentence has application to our forthcoming posting about Gobekli Tepe, for that was the region from which the sons of Shem, Ham and Japheth came. Akkad surely included the region north of Babylon near Sippar. "Sippara (Zimbir in Sumerian, Sippar in Assyro-Babylonian) was an ancient Babylonian city on the east bank of the Euphrates, north of Babylon. It was divided into two quarters, "Sippar of the Sun-god" and "Sippar of the goddess Anunit," the former of which was discovered by Hormuzd Rassam in 1881 at Abu-Habba, 16 miles southeast of Baghdad. Two other Sippars are mentioned in the inscriptions, one of them being "Sippar of Eden," which must have been an additional quarter of the city. It is possible that one of them should be identified with Agade or Akkad, the capital of the first Semitic Babylonian Empire. The two Sippars of the Sun-god and Anunit are referred to in the Old Testament as Sepharvaim. A large number of cuneiform tablets and other monuments has been found in the ruins of the temple of the Sun-god which was called E-Babara by the Sumerians, Bit-Un by the Semites. The Chaldaean Noah is said by Berossus to have buried the records of the antediluvian world here--doubtless because the name of Sippar was supposed to be connected with sipru, "a writing"--and according to Abydenus (Fr. 9) Nebuchadrezzar excavated a great reservoir in the neighbourhood. Here too was the Babylonian camp in the reign of Nabonidos, and Pliny (N.H. vi. 30) states that it was the seat of a university." As a matter of Biblical history, and I am certian that most of the Old Testament is true history, if we leave out some of the more religious parts, Akkad will be the region assigned to GAD, the seventh son of the Biblical Jacob. GAD's mother was SILPA (= SIPPAR). Today, the area assigned to the Hebrew Tribe of GAD is seen only as GILEAD , the immediate region East of the Jordan River, known in Aramaic as but that limits the area of Gad by too much, and the Bible tells us that Abraham's progeny ruled from the Euphrates to the Nile, a land which was, according to the Bible, given to the Hebrews through a covenant with God. The reign of Sargon of Akkad and his Semitic peoples was in our view thus the reign of Gad and his progeny, which however lasted only several hundred years. The Bible tells us that GAD and his tribe were later conquered by Ammonites (i.e. from Amman) viz. Amorites . These are perhaps the people in the OB written by the scholars as "Umman-manda", "Umman-madda" or "Umman-badda", a thus far"undetermined people", so write Miller and Shipp (p. 69). These Ammonites are later supplanted by the "Assyrians" who then ultimately drive the Tribe of Gad from the region East of the Jordan. Jim Stinehart writes : " “Shinar” is strongly redolent of “Sanhar” and “Sangar” and “Singara”, all which historically meant “Syria” in the Late Bronze Age." The next migration of importance is that of Jacob-Israel. Jacob's earliest seat was in Gilead, at Mizpeh. The pressure of other Aramaean tribes from the north caused him great difficulty. In the thirty-first chapter of Genesis, a document of great historical value, as we have had occasion to point out, we are told of a treaty between Jacob and Laban.... The coloring of the story is accurate, for we learn that a dolmen or cairn is erected, which Laban calls Yegar Sahdutha and Jacob, Ga'led. Dolmens, the megalithic monuments of the Indo-Europeans, are frequent in this region. What is more likely than that such a distinctive landmark of mysterious antiquity should serve as a boundary? Nor is there the least ground for supposing that the Aramaic name given the cairn by Laban is a late invention. For we have an analogy in an Aramaean Yaghra (" Hill ") near the lake of Antioch.... Another version relates that they erected a pillar (Maggebah) and called it Mizpeh. The historian's purpose is no doubt to inform us that the town of Mizpeh in Gilead, which may have been near the famous dolmen, is the site where the treaty was concluded." I have written before about the Jordan Tall Al-Umayri Megaliths Deciphered as Astronomy, but note the kind of date we are really talking about here in terms of chronology, i.e. ca. 3000 B.C. when these border stones - according to my astronomical analysis - were fixed. After all, Laban appears in Genesis in the Old Testament, so that this ancient treaty will be very old indeed.